On 21 March Judicial Watch, a US conservative watchdog, announced that it had received 756 pages of newly discovered emails circulated by Hillary Clinton and her respondents through private email servers and unsecured devices during her tenure as a secretary of state. According to the watchdog, several emails in the recent batch contained classified information. "This final batch of Clinton emails includes five new classified emails and communications with controversial figures Lanny Davis and Sidney Blumenthal", Judicial Watch pointed out. For instance, the new collection contains classified emails sent by former British Prime Minister Tony Blair to the then-secretary of state's private email address on 27 April 2011 and 19 May 2011, one of which covered the Palestinian crisis and another was titled "speech". Both were heavily redacted when released under the Freedom of Information Act. In another email Clinton discussed creating nothing short of a "private, 100% off-the-record" back channel to Israeli Prime Minister Benjamin Netanyahu. Yet another email shows that Hillary Clinton was not eager to use her official State Department account. In a letter written to Blair on 19 January 2009, just two days she assumed office as a secretary of state, Hillary Clinton specifically noted: "Tony — We are finally moving and I am looking forward to talking w you as soon as I'm confirmed, tomorrow or Wednesday at the latest. Your emails are very helpful so pls continue to use this address [hr15@att.blackberry.net]." According to BuzzFeed, Clinton used her "hr15@att.blackberry.net" account while being a US senator and continued to use it for about two months after moving to the State Department. The 20 October 2012 email exchange between senior State Department officials and Clinton Foundation employees shed light on Bill and Hillary's trip to Haiti and the opening of the Caracol Industrial Park. Having said that the Caracol Park was funded by more than $300 million grant from USAID, the watchdog recalled that the Clinton endeavour had later come under heavy criticism for a purported money waste as it had managed to create only 4,500 jobs by January 2015 instead of the initially promised 65,000 jobs. Judicial Watch noted that, judging from the documents, former Secretary Clinton had been given an official email address, clintonhr@state.gov, to conduct government business, adding that she had two additional government email accounts — SMSGS@state.gov and SSHRC@state.gov — "neither of which were configured to send or receive emails". 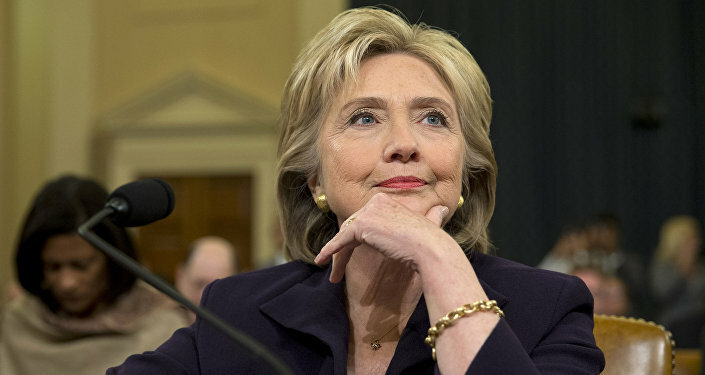 According to Fox News, the documents obtained by Judicial Watch cast doubt on Hillary Clinton's 2015 statement under oath that had handed over all of her classified emails to the US State Department. In November 2018 Judicial Watch Tom Fitton made it clear that the watchdog was determined to dig into Hillary Clinton's motivation to use her private non-state.gov email system while being at the helm of the US foreign policy. On 15 November 2018 Fitton announced that the Federal Court ruled that Hillary Clinton will have to answer the watchdog's questions concerning her private servers. Judicial Watch presumed that the former Secretary of State used a private email server to deliberately circumvent the Freedom of Information Act of 1967. In her responses under oath delivered on 14 December 2018 Clinton reiterated that she "decided to use a clintonemail.com account on the system for the purpose of convenience" which Fitton considers not convincing.